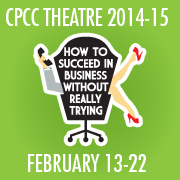 CPCC Theatre Announces Cast of How to Succeed…. CPCC Theatre is happy to announce the cast for their production of How to Succeed in Business Without Really Trying that opens February 13th in the Halton Theater. Get your tickets at the SunTrust Box Office by calling 704-330-6534 between 10:00am and 2:00pm M-F or online at CPCCTix tix.cpcc.edu 24/7. Special tickets price of $5.00 for all high school and college students with a valid ID.